Blog How to Season a Wok That Actually Works! In buying a carbon steel wok, I was told to season it before use. 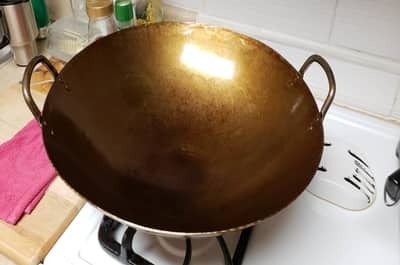 Since this was my first wok purchase, I had no idea on how to season a wok, so I decided to do some research on this seasoning process. In my study, I discovered a seasoning process that actually works. Woks which are classified as Southern Chinese woks or Cantonese woks have two looped metal handles on both sides of the wok. These woks can be seasoned in an oven or on top of a burner. That burner can be either a gas stove burner or a wok burner. 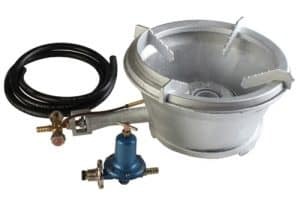 Stove burners typically will product about 1000-2000 BTU’s, depending on the stove. Wok burners, on the other hand, produce anywhere from 75,000 to 200,000 BTU’s. These wok burners are perfect for seasoning and stir-frying. Let your wok cool in the oven. Will find that your wok has changed color to a brown or black color. Below is the first video of four that will show you how to season a wok the easy way. If you have a Northern Chinese wok distinguished by one small metal looped helper handle and one long handle made of wood, bamboo, steel, or carbon steel, the seasoning process might be a little different. 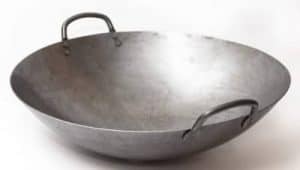 If the Northern Chinese wok has a metal handle with no wood or bamboo inserts, then this type of wok can safely be seasoned in the oven, on top of the stove or a wok burner. If your Northern Chinese wok has a wooden or bamboo long handle insert, then steps must be taken to ensure that the heat does not damage the wood or bamboo handle inserts. If you can easily remove those wood or bamboo handles by unscrewing them, it will make your job a lot easier. This bamboo handle can be unscrewed to protect the bamboo. You will need a screwdriver to remove the screw. If you did not want to unscrew the bamboo handle, you could wrap the bamboo with wet towels and tin foil to protect it. 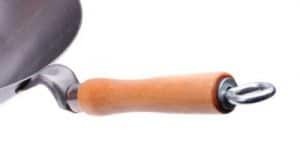 Here is a handle that can be removed by unscrewing the round ring. 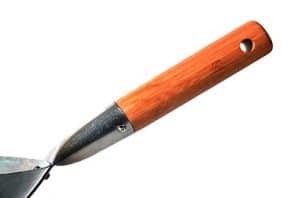 You will not need a screwdriver to remove this wooden handle. If you cannot easily remove the wood or bamboo handles, then it will be necessary to wrap those handles with a wet paper towel and then wrap the handle and the damp paper towel with tin foil. This will prevent the wood or bamboo handles from burning during the seasoning process. With a wok with two wooden handles, sometimes you can unscrew one of them, but the other helper handle has to be covered with wet paper towels and tin foil to protect it when the oven is seasoning this pan. Before I knew what I was doing, I seasoned my Northern wok in my oven without covering the wooden handles with wet paper towels and tin foil. Here is the result of my efforts. It just goes to show you that you should research things before you do them. If you are going to season your wok on your stove, it is best to use only a natural gas or propane stove. Electric glass top, ceramic cookers, or induction stoves don’t get hot enough for seasoning your wok. The following procedure is one of many seasoning procedures whereby you can season your wok on top of a burner instead of in your oven. 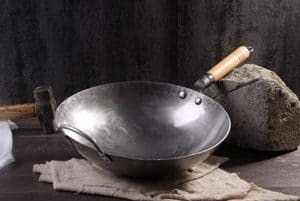 If you are going to season your wok, realize that you can use Southern Chinese woks or Northern woks and you do not have to worry about wrapping wooden or bamboo handles in wet towels or tin foil. This process might get messy in your kitchen, so if you have a choice do it outside to keep peace in the kitchen! Will Round-Bottomed Woks Season the Same as Flat-Bottomed Woks? Yes. If you use either method above they should both season the same way. Both these types of woks are made of carbon steel in they are traditional woks. 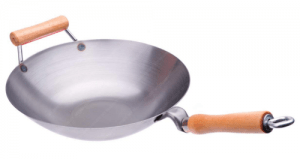 Do Stainless Steel Woks Need Seasoning? Stainless steel woks do not season well because of their element makeup. 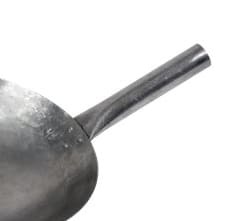 Stainless steel is denser than carbon steel, and therefore they are harder to season. 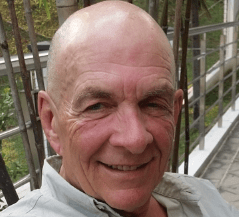 Also, you will pay more for a stainless steel wok, and you will not be able to produce the same stir-fry results as compared to carbon steel woks. The best woks are made of carbon steel.